With the advent and massive use of the internet, search engines have been used as some of the most important enabling technologies of the global network. They are used every second by billions of people across the world to seek and find information of their preference. For that reason, there are several search engines out there. 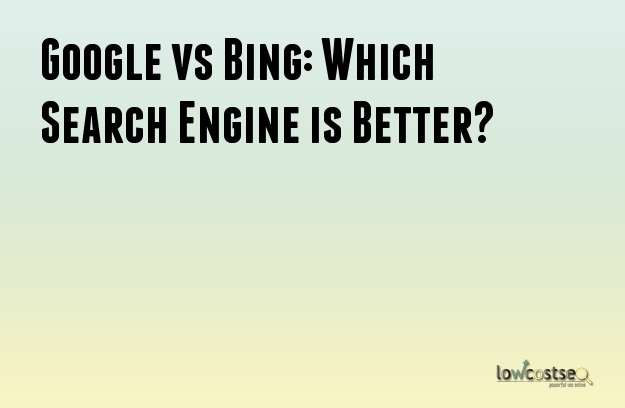 The two most popular ones are Google and Microsoft's Bing search engines, which are designed with different features, functionality, search criteria and algorithms. The two search engines capitalize on specific advantages over the other and so making them edge each other on certain aspects. This article will highlight and compare the merits of both engines, and aims to give an insight on which is better. In this particular aspect, Google has an upper hand because it is more often than not that Google's Search Engine Result Page (SERP) has better outcome results in terms of relevance. It has been tested that by typing 'Android 5', Google gives the most updated results, including even the upcoming Google I/O event whereas Bing's results are general release news and rumours. If you search a certain topic, Google will display results with information of different file types, such as PDF and Microsoft PowerPoint on its pages. Google edges Bing in this particular section by the fact that it displays results even as you are typing your phrase of interest before clicking the enter button or search button on the browser. This feature is called Google Instant, and Bing lacks this predictive function. Both engines have this key feature which gives results that are of a grammatically correct search phrase. For instance, when you type in ‘Brasil Word Cup’, both search engines will display results of ‘Brazil World Cup’ instead. However Bing exaggerates this function as it will prompt the different results in the name of auto correction. What this shows is that Bing assumes to know what you are searching more than you do. The Google's Search Engine Result Page is mostly filled with AdSense and other advertisements. This is often not of interest to the user, whose concern is to get the desired information and not go after offers and coupons! Bing presents its results in a neater manner. When users make queries that contain or return a location, Google’s search results will incorporate Google Map to reflect the visual location of the establishment or place. This is extremely helpful when searching for directions and locations of different premises, places and institutions. The above comparisons augment the distinct features of both search engines, which serve different functions and preferences. Before you make a conclusive choice, you should test both Google and Bing to have a better gauge on what suits you. It is worthy to note that both search engines can also complement each other. Academicians would prefer Google search engine due to its array of integrated features and tools.